Grenell visited the White House to meet with President Trump just last week, as Haley reportedly tendered her resignation letter. Grenell, 52, would be familiar with the job. He served as the U.S. spokesman when now-National Security Adviser John Bolton served in the position during the Bush administration, and Bolton’s proximity to Trump gives Grenell a big booster in the White House. 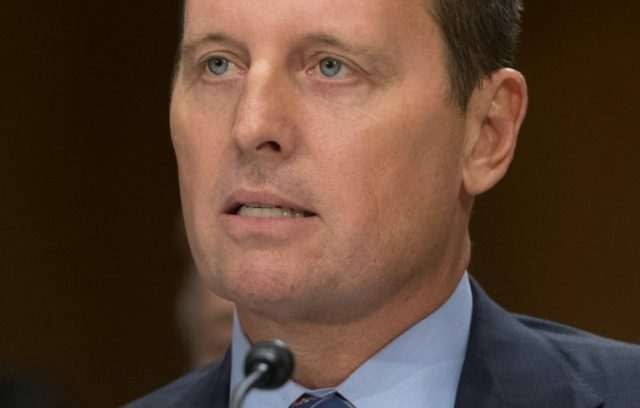 Grenell was confirmed as U.S. ambassador to Germany earlier this year, by a bipartisan 56-42 vote — which means he has already been vetted once by the Senate and could be confirmed again more easily than an outside contender. If nominated and confirmed, he would be the first openly gay person in that position. Never Trumper Max Boot told CNN on Tuesday that he thought Powell would be a good replacement. “I think somebody like Dina Powell would be a great choice because, again, she’s seen as a more moderate mainstream conservative,” he said. “Dina Powell would be somebody more on the Nikki Haley lines, more moderate and more acceptable to the rest of the world. This will be an interesting test as to where the power lies within the Trump administration,” he said. Trump has said he may name someone to the position in the coming weeks. President Trump told reporters Tuesday evening he is considering five people for the position, and Ambassador Richard Grenell is not one of them. BREAKING: Trump says he’s considering 5 people for UN ambassador. Dina Powell is one of the five. Grenell isn’t one of the 5. Former deputy National Security Adviser Dina Powell is reportedly one of the five being considered.